To celebrate the integration of mod support to Insurgency, GameBanana.com are proud to partner with New World Interactive and Razer to bring you the Official Insurgency Mapping Contest. GameBanana will select the top 10 maps submitted and send to New World Interactive (NWI) for final judging after the contest closes. NWI will also be publishing weekly tutorials on how to design and build a map for Insurgency, even creating a new map in parallel and sharing how it progresses, these will be available both on GameBanana and as Steam Guides. Maps will be reviewed by the staff from GameBanana.com and each map will be scored on the following categories, and given a total score out of 100. 1st place: $1,000 Cash, (1x) Razer 14” Blade Gaming Laptop, (1x) Razer DeathStalker Keyboard, (1x) Razer Kraken Pro Headset, (1x) Razer Death Adder Mouse, and the distinction of having their map become an official part of Insurgency. 2nd place: $800 Cash, (1x) Razer DeathStalker Keyboard, (1x) Razer Kraken Pro Headset, (1x) Razer Death Adder Mouse, plus the map may be included in the game. 3rd place: $200 Cash, (1x) Razer DeathStalker Keyboard, (1x) Razer Kraken Pro Headset, (1x) Razer Death Adder Mouse. 4th place: $100 Cash Prize, (1x) Razer DeathStalker Keyboard, (1x) Razer Kraken Pro Headset, (1x) Razer Death Adder Mouse. GameBanana will also be offering an additional $50 bonus prize for whoever produces the best Work In Progress (WIP) series either as a blog, forum post or using the WIP system on GameBanana, detailing the creation of their map, from initial concept through to final release. To qualify simply post a thread in the Insurgency > Mapping Contest Discussion forum linking to your WIP series. *All prizes are subject to participant eligibility. No cash value. The contest Organisers and Sponsors reserve the right to change or remove the prize structure at any point with or without reason. No changes to the downloadable file can be made during the judging phase, so please remember to ensure that all relevant materials and custom content are included. Full details can be found on the Rules Page, or downloaded as a PDF here. Each week the developers of Insurgency will be running a blog/tutorial detailing how to come up with inspiration and walking through the creation of an insurgency map from start to finish. Part 1: Introduction, Inspiration, and SDK. Part 2: Gameplay design theory. Part 3: Multiplayer Entity Setup. More information for everyone. >Posted by Argyll on the PlayInsurgency Forums > >##Attention finalists: > >I have emailed you all regarding the judging that will be happening this evening. We need to know which one game mode you want the map judged by. Thanks. > >There will be a livestream at 7pm EST tonight of playtesting each map with their selected game mode and from there, the judges will determine the winners. EDIT: according to twitter, the stream will be on this twitch account http://www.twitch.tv/reverbgames not the one I linked to previously. Incase people are getting curious why there hasn't been any more playtesting events for the finalists. >Posted by Argyll on the PlayInsurgency Forums > >Apologies for the extended suspense, but we've been extremely busy with finishing and releasing the Nightfall update while attending Paris Games Week. We'll get back into the swing of things later in the week! New World Interactive have announced their finalists! > **Posted by Jonny-higgins** > > > **Posted by kinggambit** > > > > > **Posted by JorisCeoen** > > > > > > > **Posted by kinggambit** > > > > > > > > I know it wont be accepted, but I updated my map (Prophet) due to a couple of aesthetic issues players had (texture packing, radar/no overview issue). I also added a few more game modes (push and ambush). > > > > > > > > Please tell me if the map crashes a dedicated server during the map changes. I have no idea what caused that issue. :X > > > > > > If you did this over the old submission, that is against the rules. Not sure why you would do so while knowing this. You should have submitted a second (temporary ffs) submission with the fixed version that you wanted feedback on. > > > > > > I hope for the judges that they already downloaded your older one... > > > > > > There are plenty of people including me who had this problem after the deadline and is a direct result of not being on schedule. Even as stupid and hard as it may sound, missing stuff is your mistake and should be payed in the score and decisions. > > > > Ya they already have the submitted copy. Was it against the rules? I just thought to release a quick update for the community since I got a lot of people telling me their dedicated servers crashed after my map and that they had texture issues (I honestly wasn't catering for the competition). Ohhh boy. Welp that was a derpy mistake if it gets me DQ'd. Thankfully they have been playtesting using my original submission and let's hope that's what they base it on. > > The judges downloaded all the maps shortly after midnight when the contest ended, everyone is using those for the judging phase. - Technically you shouldn't have updated your contest file until the final winners are out,(Instead you should have just added the new file to the normal insurgency section). > > We won't disqualify you for this, as it has no effect on our final judgement. -- The rule is basically just there to prevent people editing their map while the judges are downloading and testing them. Thanks :) My mistake for the poor assumption. I was just happy that the community was actually playing my map, so I wanted to insure they could play a solid build. > **Posted by kinggambit** > > > **Posted by JorisCeoen** > > > > > **Posted by kinggambit** > > > > > > I know it wont be accepted, but I updated my map (Prophet) due to a couple of aesthetic issues players had (texture packing, radar/no overview issue). I also added a few more game modes (push and ambush). > > > > > > Please tell me if the map crashes a dedicated server during the map changes. I have no idea what caused that issue. :X > > > > If you did this over the old submission, that is against the rules. Not sure why you would do so while knowing this. You should have submitted a second (temporary ffs) submission with the fixed version that you wanted feedback on. > > > > I hope for the judges that they already downloaded your older one... > > > > There are plenty of people including me who had this problem after the deadline and is a direct result of not being on schedule. Even as stupid and hard as it may sound, missing stuff is your mistake and should be payed in the score and decisions. > > Ya they already have the submitted copy. Was it against the rules? I just thought to release a quick update for the community since I got a lot of people telling me their dedicated servers crashed after my map and that they had texture issues (I honestly wasn't catering for the competition). Ohhh boy. Welp that was a derpy mistake if it gets me DQ'd. Thankfully they have been playtesting using my original submission and let's hope that's what they base it on. The judges downloaded all the maps shortly after midnight when the contest ended, everyone is using those for the judging phase. - Technically you shouldn't have updated your contest file until the final winners are out,(Instead you should have just added the new file to the normal insurgency section). We won't disqualify you for this, as it has no effect on our final judgement. -- The rule is basically just there to prevent people editing their map while the judges are downloading and testing them. > **Posted by JorisCeoen** > > > **Posted by kinggambit** > > > > I know it wont be accepted, but I updated my map (Prophet) due to a couple of aesthetic issues players had (texture packing, radar/no overview issue). I also added a few more game modes (push and ambush). > > > > Please tell me if the map crashes a dedicated server during the map changes. I have no idea what caused that issue. :X > > If you did this over the old submission, that is against the rules. Not sure why you would do so while knowing this. You should have submitted a second (temporary ffs) submission with the fixed version that you wanted feedback on. > > I hope for the judges that they already downloaded your older one... > > There are plenty of people including me who had this problem after the deadline and is a direct result of not being on schedule. Even as stupid and hard as it may sound, missing stuff is your mistake and should be payed in the score and decisions. Ya they already have the submitted copy. Was it against the rules? I just thought to release a quick update for the community since I got a lot of people telling me their dedicated servers crashed after my map and that they had texture issues (I honestly wasn't catering for the competition). Ohhh boy. Welp that was a derpy mistake if it gets me DQ'd. Thankfully they have been playtesting using my original submission and let's hope that's what they base it on. 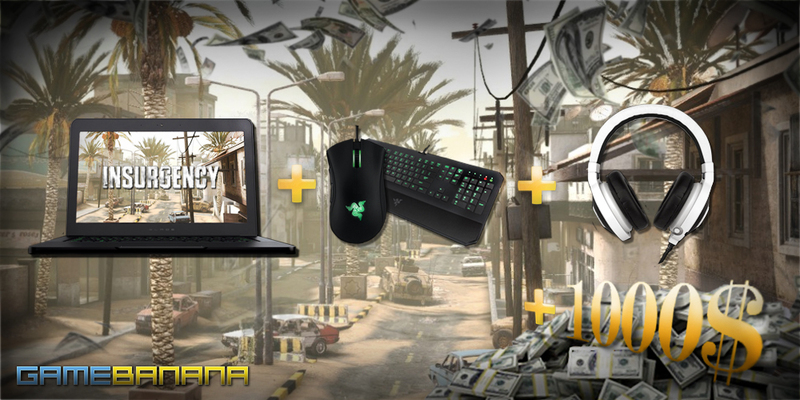 14' Razer Blade Gaming Laptop, $1,000 Cash, Razer Keyboard, Mouse & Headset bundle, PLUS your map used in Insurgency. $800 Cash, Razer Keyboard, Mouse & Headset bundle, PLUS your map considered for use in Insurgency. $200 Cash, plus Razer Keyboard, Mouse & Headset bundle. $100 Cash, plus Razer Keyboard, Mouse & Headset bundle. Login/Register to enter this contest!